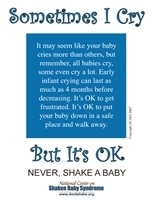 These display materials are perfect for any office, clinic, or home as a reminder to never shake a child. If you are looking for a soft approach to prevention, this poster is beautifully designed and perfect for any setting. A meaningful way to show all male caregivers the need to be gentle. Perfect for use in high schools, pediatric offices, hospitals, malls, and other locations. SBS/AHT Injuries Illustrated Package is an excellent demonstration tool. This complete packet contains seven items, including one 11"x17" and six individual 8"x10" visual illustration posters of common SBS/AHT injuries including intracranial bleeding, cerebral edema, retinal hemorrhage, rib fractures, and more.